discussion on Wednesday, September 14, 2016. Two people I would love to eavesdrop on in conversation at a nice, quiet bar somewhere are Edward Snowden and George Orwell. If that were possible, I would merely listen to them talk about the world and compare notes. Fascinating is the only thing it could possible be. 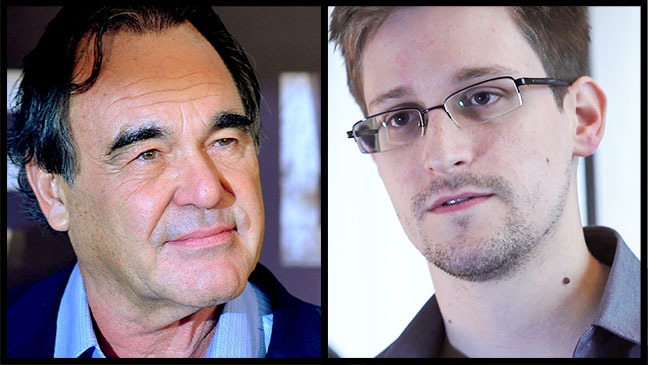 The next best thing might be experiencing Oliver Stone and Edward Snowden talk about the world and possibly compare their notes. That can occur since both of these familiar men continue into this era, but you have to show up for a special screening of Stone's new film called Snowden. It's scheduled at 700 movie theaters across the nation on Wednesday evening, September 14th at 7:30. The Stone and Snowden chat, with each participant at separate venues, will be satellited from New York and Moscow. I'm sure you're able to infer in which city Mr. Stone will be. To say that either of these men are rather controversial would be putting it mildly. Snowden has been in the news (and on film) for these last many years for whistle-blowing on the NSA and the American government doing a little eavesdropping of their own. Need I remind you that Oliver Stone have never directed a motion picture that didn't cause, at least, a considerable amount of its audience to say, out loud through gritted teeth, words not suitable for these comments. Oh, let me count the movies. Stone's cast is formidable. Joseph Gordon-Levitt plays Snowden. Shailene Woodley is Snowden's love interest and living companion. Most of the other players are as well-known or possibly more so: Nicholas Cage, Rhys Ifans, Melissa Leo, the durable Tom Wilkinson, Timothy Olyphant, Zachary Quinto and Joely Richardson ... who has revered movie-people parents. Kieren Fitzgerald and Stone wrote the script. It was adapted from two books: “The Snowden Files” by Luke Harding and “Time of the Octopus” by Anatoly Kucherena. Total running time for the screening and intercontinental back and forth will take about three, likely, fascinating hours of your time for a not terribly large amount to get a seat. Sacramento will take the event at two locations: the Greenback 16 and the Natomas Marketplace 16. The following link lists all California theaters that will screen the film and carry the Stone/Snowden conversation. Snowden opens to the general public Friday, September 16.